Level x-12 is the twelfth and final Expert level in Mario vs. Donkey Kong. It is set in Twilight City Plus. It requires all 90 high score stars and all previous Presents collected to unlock. The player first has to move right while dodging lasers, using a Bob-omb as a moving platform if needed. Jumping onto the platform above, the player has to press a Direction Switch and then climb up into the area above. Using the Springboard, the player needs to toss three Bob-ombs onto the conveyor above to open the path below on the right. The player then has to climb down a ladder and use a Bob-omb to break the Bob-omb Blocks next to the locked door, and then climb back up and wait for a Bob-omb to appear, and then quickly jump across some ropes to reach the Key. If the player moved fast enough, the Bob-omb will be below the player and they can drop onto it to ride it across the spikes and carry the Key to the locked door. Red: Near the player's starting position, under some Bob-omb Blocks. Yellow: To the left of the small area with the Springboard and two Bob-omb dispensers. 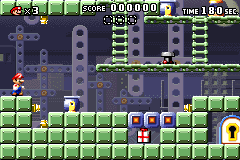 The player has to toss Bob-ombs onto the above conveyor as it is moving left to open area blocked by Bob-omb Blocks. Blue: Below the Key's starting position. This page was last edited on October 12, 2018, at 16:53.